For just about any online gamer, having a stable connection is pretty important. The kind of brief internet hiccup that might otherwise not bother a person can be a source of immense frustration for a competitive player. Even if you’re a more casual player, in the wrong game, a little bit of lag can ruin everything. Your voice chat, your stream, your streaming video, the list goes on. The Nighthawk series isn’t necessarily a gaming router series, but in its ranks you’ll find a number of excellent gaming routers. The XR300 is among the latest in the series, yet it’s already won a number of notable awards, and is now considered to be one of the best gaming routers on the market. Why? The XR300 has the potential to considerably reduce gaming latency by working to prioritize your network traffic. With a couple of minutes of configuration, you can easily tweak virtually any aspect of your connection. Quite useful to help stabilize your ping, ensure your local connection is lossless, or otherwise reduce network lag. You don’t actually need much bandwidth to enjoy games. At least, not unless you’re streaming video. In any case, the XR300 provides a full array of features aimed at non-gaming tasks. You could probably think of this as more of an entertainment router than a gaming router per se. The XR300 measures roughly 8 x 6 x 2.5 inches. 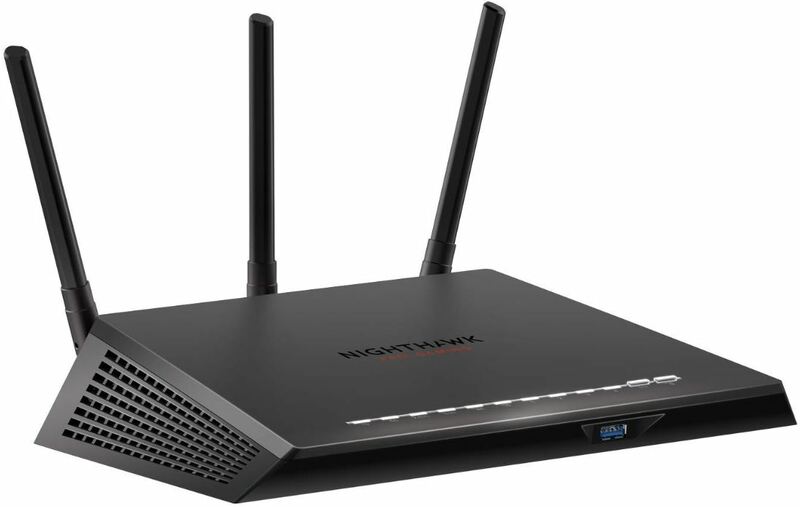 Similar to most Nighthawk routers, the shape of the XR300 is quite distinctive. Even the number of antennas is a little unique. 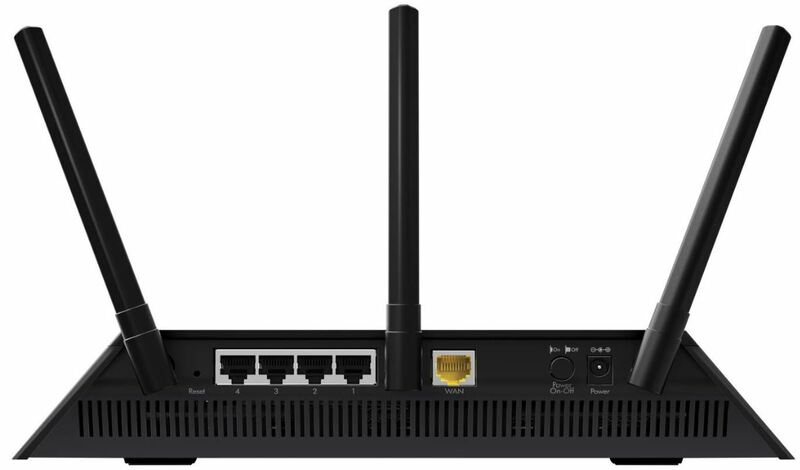 It feels like most routers end up with either one antenna, two antennas, or four and up. The XR300 is in the unique position of running three. Moreover, all three are attached to the backside. It’s increasingly common for routers like the XR300 to have their antennas positioned on at least three sides of the device, which can be a minor inconvenience for certain types of placement and installation. Antennas aside, along the front side you’ll find a total of ten indicator LEDs. They give you information about the power status of the router, the 2.4/5G bands, the status of the connection to your internet service provider, and the individual connectivity of each wired connection. And at the far end of those indicators, you’ll find a pair of analogue buttons. The buttons actually easy to miss because they match the style of the LEDs, so they almost look like just more lights. But these are actually wireless extension buttons to help you get new devices on the network with the single press of a button. The backside of the XR300 is pretty intuitive because the backside I/O is well organized and straight forward. Way off on the right side, you’ll find a DC power port and a power on/off switch. Towards the center, you’ll find a yellow WAN port, which is offset from LAN ports, and highlighted with a separate color to ensure the XR300 is approachable to novice installations. And towards the left side, you’ll find four gigabit Ethernet ports, and a reset button that’s been recessed within the chassis. Quickly getting back to the antennas, it’s worth noting the XR300’s antennas are a high performance design, made to reduce interference while maximizing network coverage. Along with the help of beamforming, they’re able to extend your network pretty effectively across the 2.4 GHz band. But the 5G band is pretty much the same as it is on any other router, requiring line of sight for connections. When you’ve got six wires running from the backside of this router, and it’s placed up against a wall, you don’t necessarily have great access to the backside. And getting access to the backside might require you to pick up the router, disturb those wires, or potentially even turn off your network. Pretty inconvenient if you need to get back there, right? Interestingly, the XR300 was built with its USB access port on the front face of the router. Somewhat similar to the reset button, the USB slot is recessed within the chassis, but not quite to the same degree. This front placement is a great idea, though. Even though it might not be the best aesthetic decision, anyone who’s using the USB port on a regular basis will be able to get much better access to the XR300. 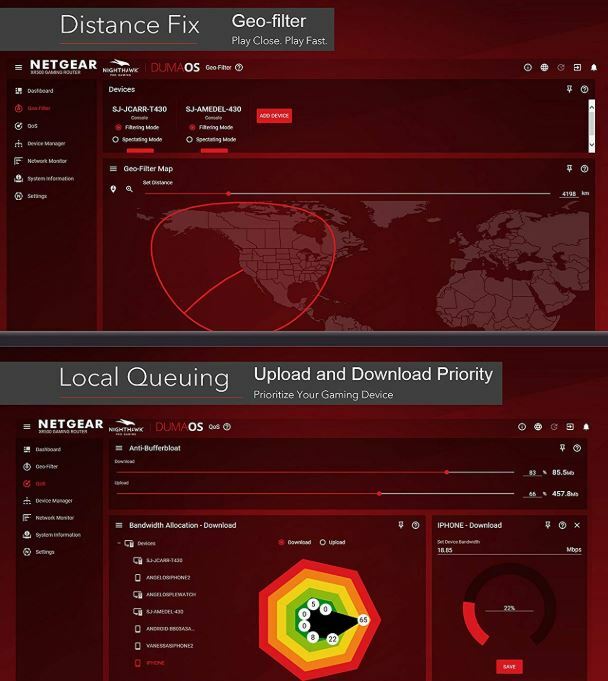 Using the Netgear control app, you can get a detailed picture of how you’re spending bandwidth. That includes a picture of who’s currently chewing through bandwidth on the network, and how much they’re using. If you want to take things a step further, it’s possible to actually establish control limits to help prioritize some devices while blocking others. Voice assistants tend to absorb a lot of bandwidth in particular, so they can be worthy of management. 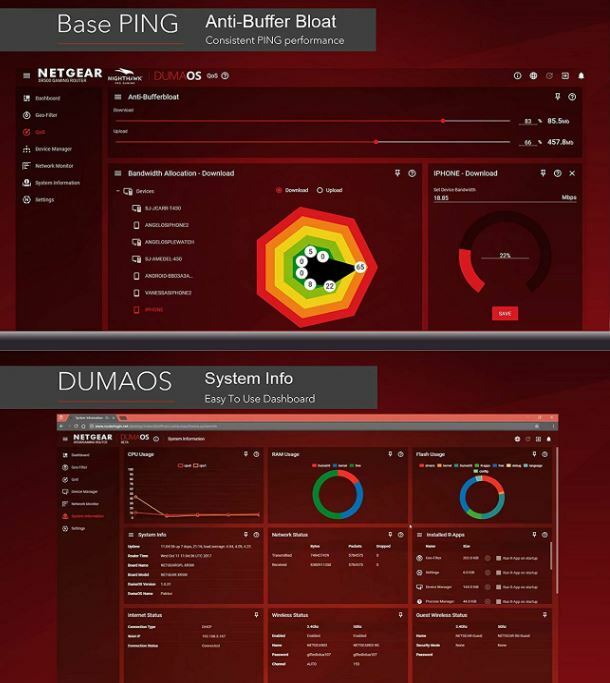 Likewise, the user interface for their DumaOS dashboard is pretty approachable. Even though configuring a router can be a pretty technical task, Netgear managed to make things a bit easier to understand. Whether you’re trying to mitigate the effects of network congestion, or ensure it doesn’t affect specific devices, you’ve got an array for quality of service options. And even novices should be able to move through the more “advanced” options. The XR300’s quality of service technology is powered by a modest 1GHz dual core processor. Not super powered by any means, but it’s powered appropriately to the requirements of the XR300’s anticipated network load. With its assistance, even when you’ve got a congested network filled with dozens of different devices, having too many connections on your LAN won’t cause gaming lag. Imagine you might have six different smart-home devices making an independent connection to your router, and you have six more smartphones doing the same. For a lot of modern routers, that kind of scenario means anyone who’s trying to enjoy a game will start running into some semi-serious network problems. One possible outcome is that your ping creeps up a little higher. Another likely outcome is that you’ll start to enjoy some lag spikes when other devices start to interact with the network for any sustained period of time. Short bursts of heavy lag can be pretty devastating in certain types of games, especially games where rapid response times are necessary. Depending on how the game’s anti-cheat is configured, these micro-stutters are even capable of causing you to lose your connection to game servers. In order to stabilize your connection, the XR300 uses anti-buffer bloat technology, which is basically a means of creating an express lane specifically made for your games. Consequently, lag which isn’t provided by your ISP can generally be avoided. With respect to its security features, the XR300 is pretty average. You can establish parental settings, and create separate guest networks. That includes the ability to establish specific controls over what content can be visited, when it can be visited, and how much bandwidth they can use. The only way in which the XR300 really shines here is in transparency. It’s great at letting you know what’s going on over the network. But to its credit, the XR300 does add on another layer of customization potential by letting you determine minute-by-minute bandwidth rules. You also have some basic access to VPN features, but really only as many as a gamer might need. It doesn’t quite have the same level of robust VPN support that you might find from an enterprise tier business router. But you shouldn’t have a problem getting any existing VPN services you use to play-nice with the XR300. 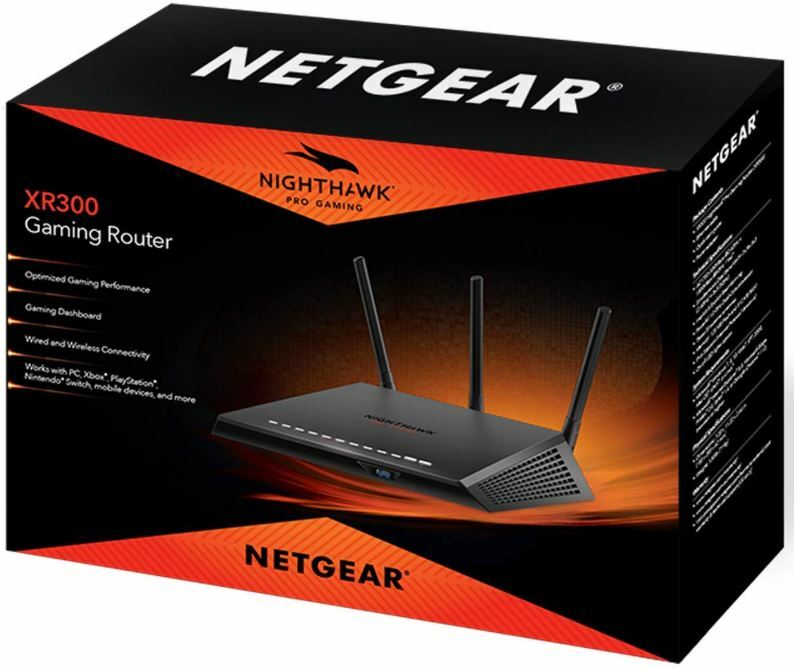 Similar to almost any modern Netgear router, the Nighthawk XR300 supports automatic firmware updates. You don’t have to spend time checking for updates or bothering to install them. The router basically takes care of itself. Pretty cool. 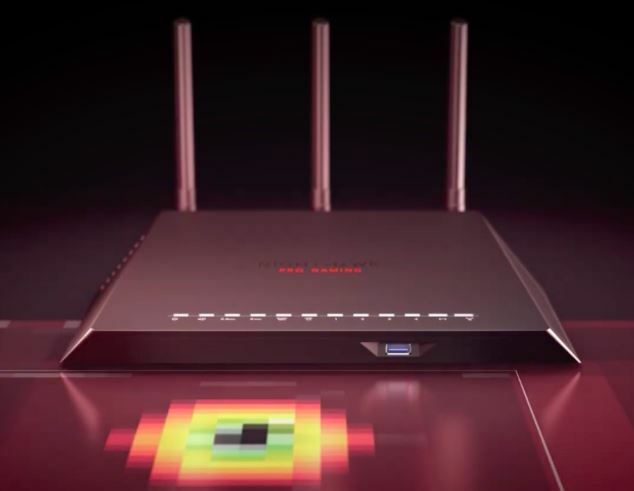 To some degree, the idea of a gaming router is a little silly. Because plenty of non-gaming routers still have the ability to help you make similar game-facing customizations. For instance, you might still be able to prioritize traffic with many mid-shelf routers that have nothing to do with gaming. But the XR300 is really about making those features highly accessible, bundling them in one place, and taking as much off your plate as possible. It’s about prioritizing games from the first moment you start using the router, so you don’t have to spend a bunch of time setting things up every time you play something new. Different types of games have different types of networking standards. Some games will kick you out the moment they detect you’re lagging; others don’t mind as long as your ping doesn’t exceed 5000ms. Whether or not the XR300’s game-facing features can really help you does at least partially depend on the sort of games you’re playing. 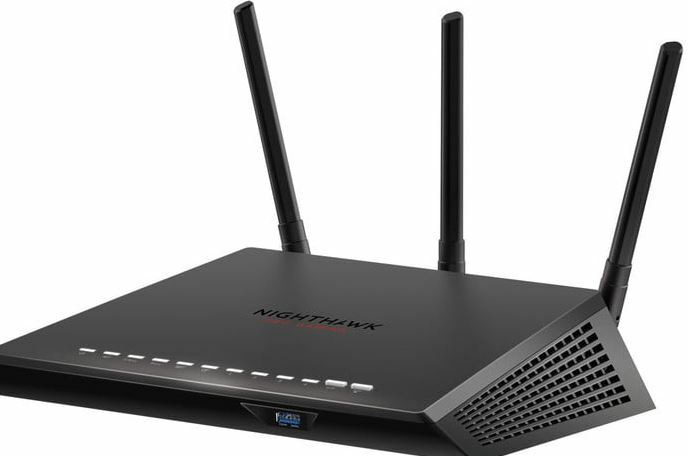 Who Should Choose the NETGEAR XR300 Nighthawk Pro Gaming Router? The NETGEAR XR300 Nighthawk Pro Gaming Router is a pretty good choice for gamers who aren’t necessarily networking wizards. It’s also a good choice for lazier people who don’t want to have to bother with setting up their gaming settings in a more laborious process. Of course, you don’t actually need to be a gamer to get the best benefits this router has to offer. Its abilities can be applied equally well to things like streaming content. The same things that help make your games smoother can be turned to making your videos a bit smoother, too. You could easily prioritize your connection to Netflix, YouTube, or a similar streaming service. If you were looking to fill an incredibly large area with Wi-Fi, the XR300 would not be able to do that on its own. But it is possible to conjoin the XR300 with other units, and effectively extend the already formidable size of its network radius. With that said, XR300 is a pretty good choice for someone interested in a future-proof network at an effective price.